Καθολικός διάκονος: "In this dread act your strength is tried"
It's been a long time since I had a week as downright difficult as this week. I am eager to walk the Stations of the Cross this evening. Why so difficult? Is work going badly? No. Have I suffered a great loss? No. I did learn that Archbishop George Niederauer, who ordained me while serving as bishop of the Diocese of Salt Lake City, a man of whom I am very fond, is not doing well. In fact, he's close to passing over. Last Friday was the funeral for a brother deacon who was my classmate in diaconal formation. Today we celebrated the funeral Mass for one of our dearly beloved parishioners. Also, my best friend's Dad died today. Of course, there was the utterly unconscionable chemical attack in Syria this week, our response to it, and with both the prospect of more innocent people being killed and forced to flee even as we protest taking in refugees. There is something about dealing with death makes me want to rebel. My rebellion is my audacious faith in Christ's resurrection. This faith, more precious to me that anything, is a gift from God. Without it I would be lost. 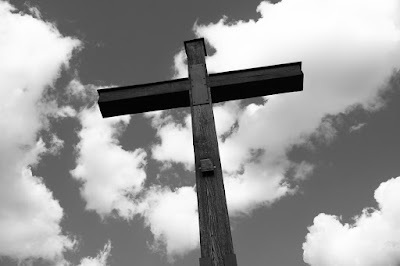 It is only the Son of God hanging on the Cross that allows me to make sense of things, even as I realize my complicity in and guilt for Christ's death. My prayers are for you and your bishop, our brother deacon, and all who suffer in life, or who face death.